How I've worn the top before: here. Please forgive me if my presence seems lacking on your blogs and the rest of the Internet -- I am still under the weather. I slept so soundly for 12 hours on Monday, that by the time I woke up mid-afternoon I wanted to make up for "wasting" my day and I begged Jeremiah to take me out. Taking me out consisted of trips to the bookstore and the library so I could read some of the latest magazines and photography books. What can I say, I'm a pretty easygoing date. 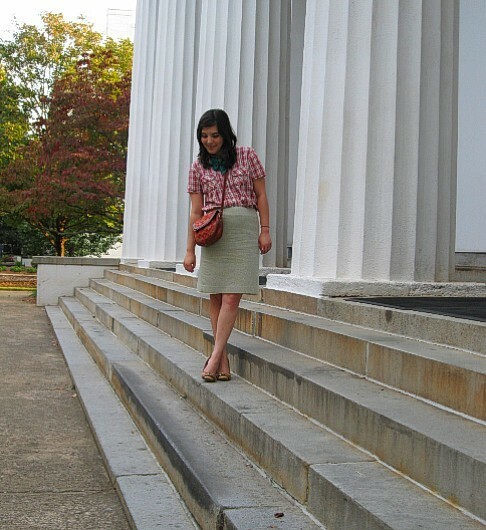 I made an effort to not feel sick by dressing up, and I took these photos on the steps of the campus chapel building. 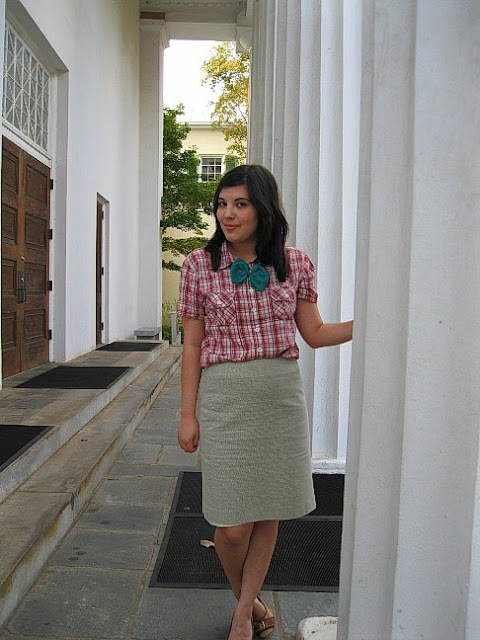 I wore this outfit last Friday and decided to repeat it Monday because I loved it so much. It's a bit Annie Hall, isn't it? 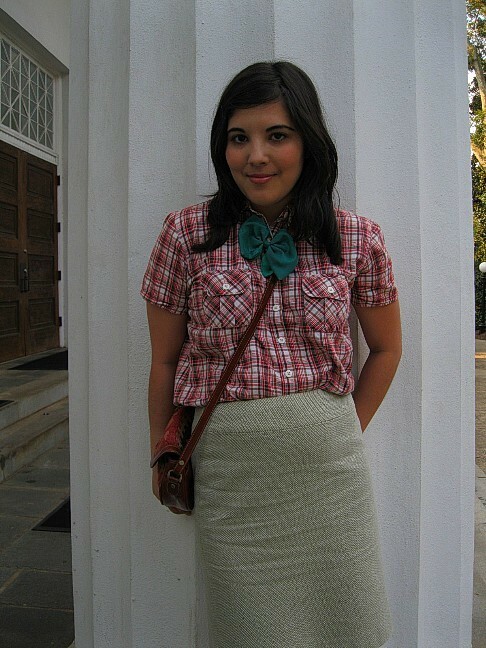 Remember my bow as a brooch in this outfit? I simply moved it further up my blouse and made it look like a bow tie. No safety pins were needed -- I just shoved the barrette holder into the buttonhole and then buttoned as usual (it also helped that the buttonhole was big enough to allow that). I feel like this is a quintessential fall outfit, what with the colors and plaid and all. What do you wear on your sick days? Hi!Joan.this shirt seems difficult to style but you did a great job.The hairbow idea was genious. I certainly don't look as cute as you on my sick days. I wear sweats and a tee and stick my tush on the couch. 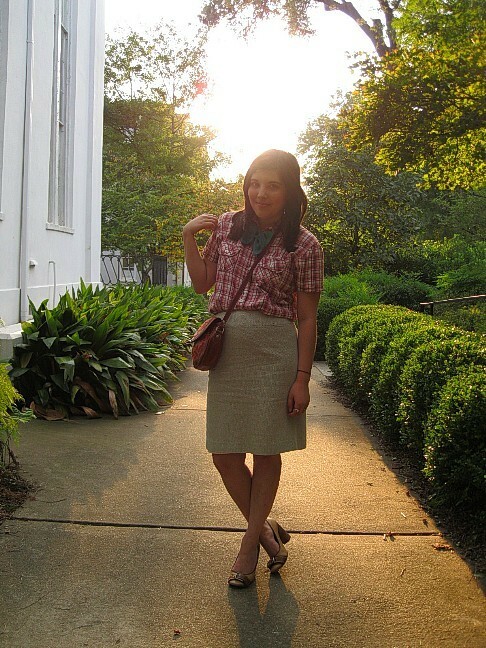 I have a skirt similar to that one (I think so, anyway) and I'm having a hard time figuring out how to style it. This is an idea... :) You look great, as always! Hope you are on the mend now. lovely outfit, you sure don't look ill. I was ill for quite a long tiome recently, and in the first few days wore really boring black and drey clothes, becuase i knew that no matter what I'd wear i'd feel like poo. But once I was feeling a little bit better, I decided to dress up again to cheer mself up. Hope you're feeling better. :( I love the detail in this outfit and the little bow is just genius! amen to the sick and weary, friend! hope you're feeling better soon. i just love this skirt on you--you look super super tall! Does that skirt have a shimmer to the fabric? It's absolutely lovely. I wear a blanket, a big fluffy and warm blankie when I'm sick! I'm sorry J, I didn't know you were under the weather! It's been crazy here lately, it's actually a bit difficult to blog lately but I truly appreciate the sweet words you leave me/us. I'm so grateful to have you as my friend too! and I miss you lots! Very cute! Love the bow tie. And lovely backdrop/setting for your pics. This time of year, North Campus is GORGEOUS! @ Lori: Actually the design of it has little dots on it, not a shimmer print, though I can see how it looks shimmery in the photos! I'm sorry to hear you're still feeling under the weather - hopefully a day of relaxing helped you. And you look fantastic. I love the bow-as-brooch. hmmm, on my sick days i am usually wearing sweats because i stay at home in bed! but on days where i am just feeling under the weather a bit, i wear skinny jeans and flat boots and with flowy top. anything with pockets for my kleenex! Cute bowtie! I love your skirt! What a cute idea! Hope you're feeling better soon! You look darling! LOVE the hair bow turned bowtie, and all the photos are just lovely. Quirkily classic! When I'm under the weather I don't leave the house and I stay in my PJs all day.